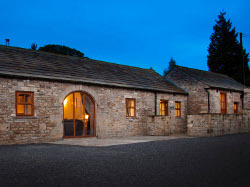 Sunrise Barn is a 4 bedroom converted milking parlour situated on Low Green Farm in the village of Romaldkirk, Teesdale. This beautiful Barn has everything you need for a relaxing and enjoyable holiday with either friends or family. The barn has been finished to a very high standard with fabulous roof height ceilings and a log burning stove. It is perfect for entertaining or simply relaxing. Every room is fully equipped with everything you need and more. Sunrise Barn is a fantastic, private, child and dog friendly outdoor area, which has been landscaped to ensure everyone can enjoy it. To top it all off we have installed a luxury hot tub which looks out over the view of Teesdale. The hot tub is ideal for enjoying a chat with friends, a glass of wine or a good book. Each bedroom has its own ensuite bathroom or wetroom. We ensure the beds and bedding are the most comfortable we could find to make sure our guests get a good nights sleep. Above all Sunrise Barn is a family run holiday cottage and our aim is to make sure you have the best possible holiday with us. We will do everything we can to ensure you have everything you need from bottle openers for the wine to information about the local area.